Part two of the assignment was to choose a recipe and to cook it. I wanted to go for one of my own classics. To me, it seemed much more challenging to reproduce something familiar then an unknown. I went for Quiche Lorraine which strangely enough I have never posted, though I tend to create it regularly. To make the pastry, place the flour and a pinch of salt in a large bowl. Rub in the butter until you have a soft breadcrumb texture. Add enough cold water to make the crumb mixture come together to form a firm dough, and then rest it in the fridge for 30 minutes. Roll out the pastry on a lightly floured work surface to the thickness of about a £1 coin. Lift the pastry over the rolling pin, then drape the pastry over the tin and press into the base and up the sides. Trim the edges. Place in the fridge to chill for 15 minutes. Heat the oven to 220c, 200c fan, Gas 7. Line the pastry case with a circle of baking parchment and fill with baking beans. Bake the pastry case for 10 minutes until pale golden. Remove the baking parchment and beans and return the pastry case to the oven for a further 5 minutes until golden and crisp. lower the oven temperature to 190c, 170c, fan. Gas 5. In a dry frying pan, fry the bacon for 2-3 minutes until just tender and golden. Place in the pastry case. Very easy recipe to follow. The quiche was moist and tasty. Don't be tempted to skip any step, especially the blind baking. There is a lot of butter in the pastry and without baking blind it would get soggy. I LOVE the Baking Mad Website and often refer there for recipes! 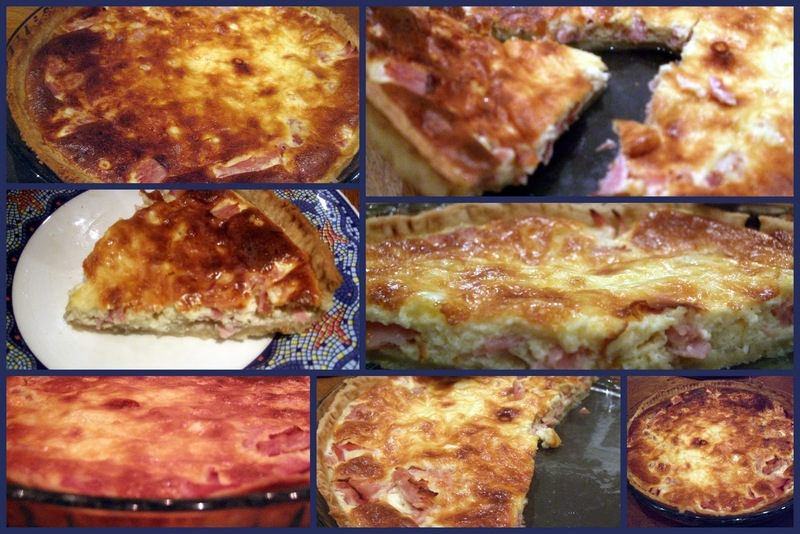 This looks fabulous......LOVE quiche! Must go and have a look at that. Your Quiche looks great. Thanks Janice and Karen for dropping by. Scoop, next Albanian food.